CARBONDALE, Colo., July 16, 2017--- Redemption was sweet for Casablanca. 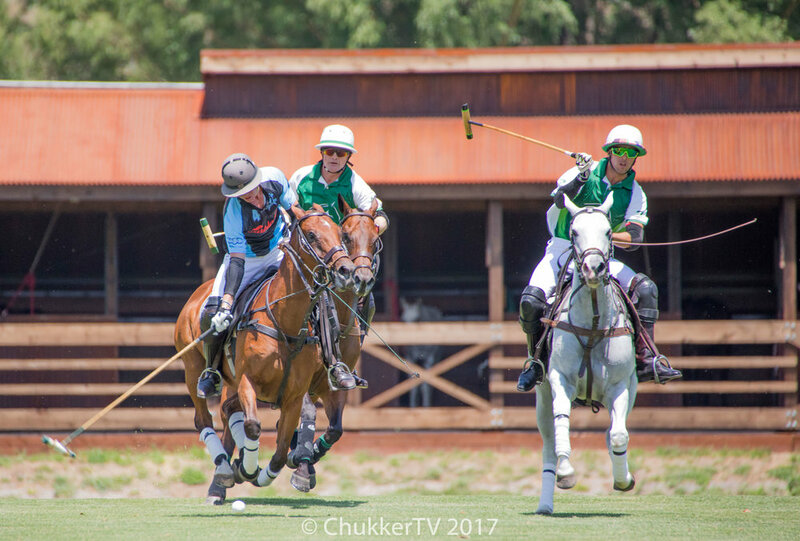 On a perfect day for polo at Aspen Valley Polo Club, Casablanca played textbook team polo to dominate the first five chukkers and capture the Basalt Handicap with an 8-6 victory over Tonkawa in front of a large crowd and worldwide ChukkerTV audience. Grant Ganzi of Casablanca controls the ball despite being double teamed. In last weekend’s ChukkerTV Challenge final, Casablanca lost to Tiburon, 10-9, in the final seconds after leading for most of the game. Casablanca’s foursome of Mariano Gracida, Grant Ganzi, Pablo Dorignac and Juancito Bollini were so well-balanced and performed equally well that they shared the Most Valuable Player award. Tonkawa (Jeff Hildebrand, Carlitos Gracida, Lucas Lalor, Jimmy Seward), after being held scoreless for four chukkers, rallied for five goals in the final chukker but fell short. Zig Zag, a 10-year-old Argentine bay mare owned and played by Hildebrand in the sixth chukker, was named Best Playing Pony. Both teams started out slowly in the scoreless opening chukker. Casablanca picked up steam in the second quarter for a 3-0 lead with goals from Ganzi, Dorignac and Bollini. After a scoreless third chukker, Casablanca started building on its lead with four goals in the next two chukkers for 5-1 and 7-1 advantages. Tonkawa ended up scoring some of the goals it missed for most of the game, outscoring Casablanca, 5-1, in the final chukker. A combination of forced and unforced errors had Tonkawa missing five goals in the first half and seven more in the second half. Tonkawa was attacking on offense but was unable to finish its goals. Ganzi scored a team-high three goals. Gracida and Dorignac each had two and Bollini added one goal and was outstanding on defense. Hildebrand led his team with three goals. Lalor, last week’s MVP, was held to two goals. Carlitos Gracida added one. In the subsidiary round robin game, Los Amigos (Alejandra Foster, Gabriel Gracida, Nacho Novillo Astrada, Paul Foster) defeated La Karina (Ailsa Currier, Brian Boyd, Mike Azzaro, Stewart Armstrong), 4-2, in the final game to win. In the other two three-chukker games, Los Amigos edged Audi (Marc Ganzi, Melissa Ganzi, Juan Bollini, Bill Kirton/Johnny Kirton), 4-3, and La Karina defeated Audi, 5-3. Paul Foster was named Most Valuable Player after scoring a team-high four goals. Honey Bee, ridden by Stewart Armstrong and bred by his brother Charlie Armstrong in Florida, was named Best Playing Pony. Melissa Ganzi of Audi scored a team-high four goals to lead Audi. Alejandra Foster, Brian Boyd and Ailsa Currier each scored three goals. The polo doubleheader benefitted the WindWalkers Equine Assisted Learning and Therapy Center. Founded in 2005, the non-profit’s mission is to provide a variety of equine-assisted therapies to aid in the development and growth of those with challenges including physical, neurological, emotional, behavioral or psychological. The Basalt Handicap was the third of 12 tournaments scheduled, eight grass and four arena tournaments including the July 25-Aug. 6 USPA National Arena Handicap. 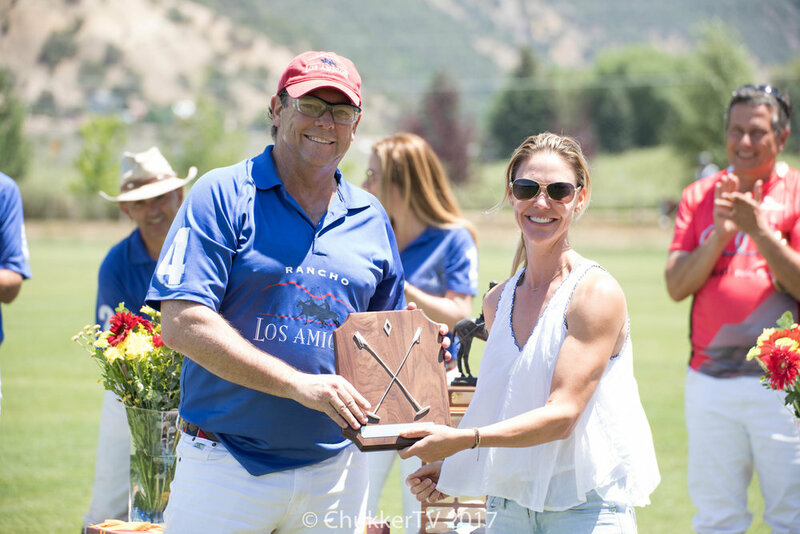 Polo is increasing in popularity in Aspen and surrounding areas with the club’s offering of various weekly tournaments, Gladiator Tuesdays, Kids Polo, indoor and outdoor arena polo, charitable events and The Polo School. Practice sessions are also held for players competing in weekend tournaments. ChukkerTV, leaders in polo broadcasting since 2014, is live streaming the club’s entire summer season. All past tournaments can be found on its website. The exclusive Aspen Valley Polo Club is one of the nation’s fastest-growing polo clubs. It offers polo in the summer for players and spectators. The Polo School is available to adults and juniors. It offers individual and group lessons for all levels and ages. For spectators there are great field side views for tournament action, indoor and outdoor arenas and also the Aspen Valley Polo Club Boutique. Everyone is welcome to watch polo in a relaxed atmosphere with complimentary food, refreshments and weekly asados. Admission and parking are free. For Polo On Demand price rates of group and private lessons, arena chukkers, grass chukkers and individualized “Polo Experience” packages email aspenvalleypolo@bellsouth.net or log onto www.aspenvalleypoloclub.com.